There are plenty of options to choose from when it comes to choosing a website building platform: Wix, Sitebuilder, Weebly, Squarespace, WordPress.com and WordPress.org to name just the big players. With so many options, it can be overwhelming to know which one you ‘should ‘use. This overwhelm often leads to choosing based on price or on what your friends are using and neither of those means you’ll be making the best decision for your business. I make no bones about the fact I love WordPress.org and think everyone could be using it, no matter where they are on their business journey! However, before I sing WordPress.org’s praises, let’s talk about the difference between the platforms. Many website building platforms are free and therefore the temptation to use them is massive. Platforms like WordPress.com Wix, Weebly and Squarespace are ‘all in one platforms’ and most have both free and paid versions. Paid or free, these platforms do allow you to add pages and posts, use themes and, to some extent, customize your site with your branding. The paid versions usually enable you to remove their branding too and offer more advanced options. Many people choose to use one of these website building platforms to build their site because right off the bat they seem easier than WordPress.org. There are fewer moving parts to pull together and, because of the limited functionality, the learning curve isn’t as intense. If you’re determined not to embark on learning WordPress.org, then, of course, one of these platforms could work for you. If you don’t plan to develop your website beyond a portfolio/online resume and if you can say for sure you won’t want (or need) to add advanced functionality (eCommerce/SEO/membership areas etc) then don’t let me sway you out of your decision. This is a great overview of which platforms work well. On a side note, don’t be fooled into thinking that making a move from free WordPress.com to business WordPress.com is the same as moving to WordPress.org – it doesn’t give you much more functionality and quite frankly I don’t really see the point in the business plan! As I mentioned, there are various parts that need to come together for a self-hosted WordPress.org website. Namely website hosting, the domain, themes, plugins and Wordpres.org itself. I will talk about everything you need to know to get started with WordPress.org in a separate post. For now, let’s focus on why WordPress.org is the best website building platform whatever your business structure and goals. 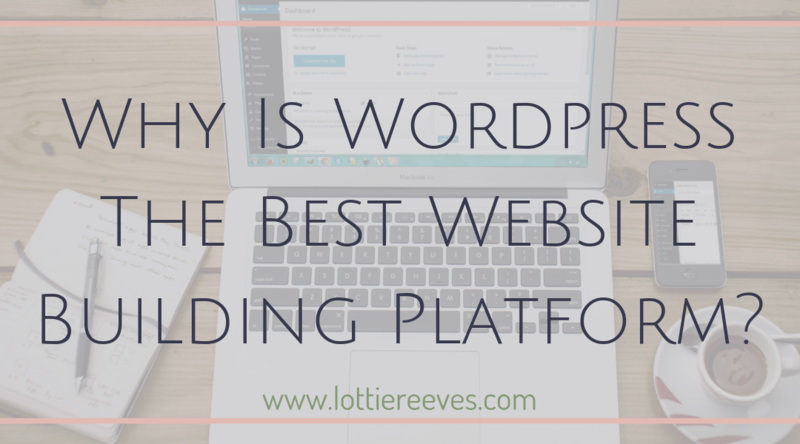 However, if you’re on the fence and are willing to not give in to the temptation of a free website builder, let’s dive in to why I think WordPress.org is the bomb? Unless you have had your head in the sand for the last however many years, you are probably fully aware that the Google Gods need to ‘like’ your website for you to appear when someone searches relevant keywords. One of WordPress.org’s most important strengths is the fact that your website can be fully optimized to help with SEO rankings, user experience and all the other technical things that Google looks for. For example, you can optimise your images so they are losslessly compressed ensuring they load faster. You can cache your website’s data ensuring that your site is as light as possible. You can create a website that’s intuitive and fun for users to experience no matter what device they are viewing it from. This optimisation can seem daunting and it’s something that puts many people off getting started with WordPress.org. However, it’s important to think that if you’re going to all the effort of building a website for your business, you need people to find it and to enjoy their time on the website once they are there. You only have a few seconds to capture users attention and turn them into fans and customers – slow, ugly, non user-friendly websites don’t do this. WordPress.org provides unlimited options for functionality. Whether you want to create a membership system, an online store, an online course, a booking platform, an affiliate program, with over 54,000 plugins in its repository, it’s safe to say that whatever you’re going to want to do, there’s a plugin for it. And that figure doesn’t include many of the premium plugins that need to be downloaded from the developer directly. This not only means you can grow and develop your website as you and your business evolve but it also means you only need to set up and configure what you need, when you need it. That makes the learning curve easier to handle – getting to grips with the basic functionality of WordPress.org can take a while but knowing you don’t need to dive right in with everything at once makes that a little less intense! It also means you don’t have an excuse not to get started – no more “when I know how to create a membership site I will launch my website” Just create what you need, as you need it. In addition to the fact that you can use WordPress themes and plugins to build whatever your heart (or business) desires, the fact that they are all built on the WordPress framework means there’s a similarity across the board. WordPress.org hosts around 37 million websites – if all those people are putting it to effective use, WordPress.org has to be offereing something right! With so many websites being built on this website building platform, you’re always going to find help and support if you do come stuck. There are endless conversations about WordPress.org in Facebook groups, forums, and online chat rooms. You’ll likely come to realize that generally speaking the WordPress community is filled with friendly geeks who like to try and solve problems for other people. And if all that doesn’t solve your problems, there are plenty of WordPress specialists who can be hired with any budget. The extent of how far you can go with customising your site can vary from theme to them. However, on the whole, building a website on WordPress.org means every aspect of your site can be customised with your branding and style. Premium themes offer the most options but there are plenty of decent free ones that give enough options to get you started. Once you’ve decided to go with WordPress as your website building platform, you’ll need a theme. Have a read of what I think you should look for in a WordPress theme to get started. In May 2018, the EU bought out new rules focusing on data protection for users. Any site that can be visited by a EU citizen is now required to be GDPR compliant and there are various aspects involved in becoming compliant. Unlike other website platforms who put very basic functionality in place so users could in some way be compliant, WordPress.org ensured that users have the tools they need to be fully compliant. Most 3rd parties who create plugins and themes also put things in place to ensure compliance. The fact that you can start with a blank canvas means that there really is nothing stopping you from creating the website that your users need while representing your personal brand. Of course, the more complex the journey you want to take users on, the more complex the creation will be, but you really are only restricted by either your imagination or your capability. Luckily, there are plenty of WordPress experts (ahem…) out there who can overcome your lack of technical skills and bring your vision to life with WordPress.org. Yes, there is a steep learning curve to WordPress and, especially if you’re moving there from a different website building platform, it might seem intense. However, chances are in the long run you’re going to end up with your site on WordPress.org so instead of learning something else first then migrating and needing to learn a new platform, it makes sense to start with WordPress.org from the get-go. I would love to hear about your experiences with different website building platforms. Are you a WordPress.org fan or do you use something else? What do you love or hate about your current platform? Great article! It’s so nice to find out more about what platform to use when starting a side business.